You’re expecting a baby – congratulations! Now is the time to research the market and start preparing for your little one’s debut. The central feature of any nursery is, inarguably, your baby’s crib. However, once you’ve made your choice, you’re faced with even more important decisions: what are you going to outfit your baby’s crib with? Restful sleep is crucial for newborns, who are in need of a relaxing surroundings in order to adjust to life outside the womb. Now helping your baby make the most out of his or her sleeping is easy – without detracting from your nursery’s modern aesthetics, too! The Danha fitted cotton crib sheet is a beautiful addition to your infant’s bedding collection. Complementing any nursery color palette, it is a great choice for parents looking to create a calm sleeping environment for their precious baby. Made from 100% cotton, our crib sheet is smooth to the touch and holds its immaculate shape and amazing design intact, even after many washes! Fitting snuggly over any standard-sized crib mattress, our fitted sheet is easily spread, as well changed, with zero hassle, making it a necessary purchase for busy moms of young babies and active toddlers! Our sheet’s charming deer print is fit for any little prince or princess, who is sure to enjoy countless hours of resting or playing on this comfy, fitted sheet! Purchase Now The Most Beautiful Piece Of Baby Bedding On The Market & Gift One To Every New Parent, Too! 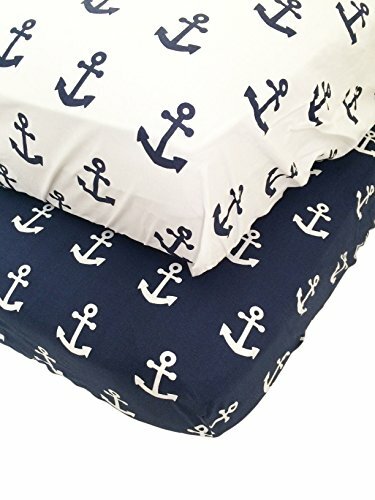 TIMELESSLY FASHIONABLE ANCHOR PRINT: Intricately contrasted white anchor print against a muted, darker background makes for an attractive crib sheet, which is just as beautiful in person! You will have a great time taking your newborn’s first pictures or baby’s monthly milestone pictures, using this amazing piece of bedding as a backdrop! PREMIUM FIT FOR ALL STANDARD CRIB MATRESSES: Measuring at 28 x 52 x 9″, the Danha premium crib sheet effortlessly fits over any type of standard crib mattress. Featuring superior elastic, it provides a secure and tight fit, without folding or bunching, giving your baby’s crib an overall polished and modern look, while keeping your baby safe and secure, too. NAUTICAL NURSERY DÉCOR THEME STAPLE: Nothing’s more beautiful than decking your baby’s nursery with earthly, muted tones and natural accent features. If you are looking to create a seas nautical as part of your little one’s nursery, then our fitted crib sheet is your best choice for taking care of even the smallest details of your décor theme! THE PERFECT BABY SHOWER GIFT: Make any expectant parent happy by presenting them with this outstanding crib sheet, which combines functionality and style. Whether they’re expecting their first baby or the newest addition to their family, every mom and dad will be delighted upon laying their eyes on this cute crib sheet! Great buy though for the price I would give it 5stars but they are a tad stiff. Great buy though for the price, very well made.